SAN FRANCISCO--(BUSINESS WIRE)--Twitch, the world’s leading social video platform and community for gamers, today announced the closed beta of its HTML5 Video Player. Starting today, users with Turbo subscriptions will be able to join the beta and begin viewing broadcasts in HTML5. Twitch will be expanding access to the closed beta to more users in Summer 2016 and the current Flash Player will eventually be sunsetted. With HTML5, viewers are expected to enjoy a smoother streaming experience with faster load times and more consistent delivery of high frame rate broadcasts than the current Flash Player. HTML5 is also known for allowing longer viewing sessions by taking up less CPU and battery life. Viewers in the closed beta can toggle HTML5 on and off via Player Settings on the channel user interface. Read more about the HTML5 closed beta and full launch schedule in the Twitch blog post. For daily updates, visit the Twitch blog, Twitter feed and Facebook page. Social links: @twitch, #Twitch. Twitch is the world’s leading social video platform and community for gamers. Each month, more than 100 million community members gather to watch and talk about video games with more than 1.7 million broadcasters. Twitch’s video platform is the backbone of both live and on-demand distribution for the entire video game ecosystem. This includes game developers, publishers, media outlets, events, user generated content, and the entire esports scene. Twitch also features Twitch Creative, a category devoted to artists and the creative process. For more information about Twitch, visit the official website and blog. 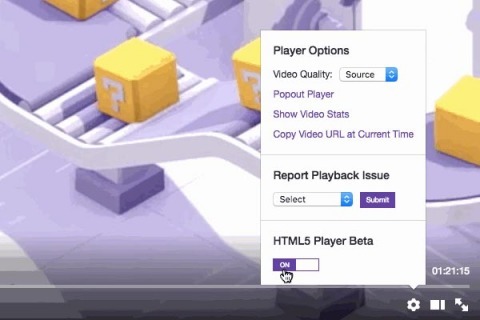 Today Twitch announced the closed beta of its HTML5 Video Player for select users. The beta aims to provide a smoother streaming experience with faster load times, among other benefits, for viewers.